When my brother and I were children, Halloween was a time for a lesson in thankfulness that we had enough to eat. Our refrigerator and pantry were always filled to the brim because our parents had suffered grave hunger in their youth in the Holocaust. My mother said she weighed 70 pounds when she became pregnant with me. Cleaning your plate at meals was a requirement. If we were not interested in finishing our dinner, we heard about how our parents were starving in concentration camps, saw children dying of hunger, ate bark off trees, moldy crumbs they could find and worse (TMI for us then and you now). In our family, we cleaned our plates quickly. So, at Halloween, candy was not spoken of. UNICEF, and then the starving children in Europe, recovering from the devastation of World War II, was the topic of the holiday. We were taught to appreciate the privilege of being an American, of what we had and to help others less fortunate. With the current generation of parents interested in nutrition and healthy eating and worried about obesity, this is the day and age for parents and grandparents to divert the focus from candy and sweets at Halloween and speak up about those who do are less fortunate and do not have enough to eat. We do not think of the United States when we think about children being hungry, but think again. the United States Department of Agriculture (USDA) 2011 statistics showed 16.7 million children under 18 in the United States live in households where they are unable to consistently access enough nutritious food necessary for a healthy life. In 2011, 16.1 million or approximately 22 percent of children in the U.S. lived in poverty. During the 2011 federal fiscal year, more than 31 million low-income children received free or reduced-price meals through the National School Lunch Program. Unfortunately, just 2.3 million children participated in the Summer Food Service Program that same year. And what happens on weekends during the school year? Consider telling your grandchildren about the Backpack Food Program. How can a child focus on solving a math problem or memorizing a new word when she or he is trying to ignore the persistent pangs of hunger? Across the country, teachers and school nurses have found that in some instances, Monday morning comes and they are forced to compete against hunger for the attention of their students. More than 18 million children qualify for free or reduced price meals through the National School Lunch Program, the fuel that they need to get them through the week. What happens to these children when they go home over the weekend? For more than 15 years, the Feeding America BackPack Program has been helping children get the nutritious and easy-to-prepare food they need over the course of the weekend. Today, bags of food assembled at more than 150 local food banks are distributed at the end of the week to nearly 230,000 children every year. Put “Backpack Food Program” into google with the name of your local community. In many communities the local Kiwanis Club is participating in the program. In our community, and maybe yours, the Kiwanis Club (of Oakland Park) is sponsoring a project modeled on a charity that Naomi Judd supports in Appalachia.. Knowing that many kids do not eat from the time they leave school on Friday until they return on Monday, Kiwanis is sending food home in a backpack for those children every weekend. Contact the local charity and offer to have the grandchildren trick or treat for canned goods and other items for the backpack program. Ask what they want at the current time. They need beans, tuna fish, and other nonperishable protein foods. They try to send home with the child peanut butter, jelly and a loaf of bread as well as other food items. On Halloween, the grandchildren can use their own backpacks and hold a homemade sign about the program, or, if possible, bring a wagon for the food products. 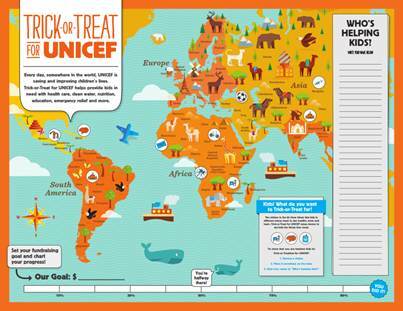 Of course, Trick-or Treat for UNICEF is still around. You can go to the website and order the boxes on line. This October, thousands of volunteers will participate in Sight Night to collect used eyeglasses for recycling and distribution to people with vision impairments who cannot afford new glasses. Over the past ten years, more than 160,000 volunteers have collected more than 1 million eyeglasses. The collected glasses are cleaned, repaired and sorted by Lions clubs and Give the Gift of Sight volunteers. This recycled eyewear is then hand-delivered on international missions, providing clear vision to those in need-some for the first time. “Sight Night is a wonderful chance for children to combine the fun of trick-or-treating with an activity they know will help someone see clearly,” said Tom Witkowski, a member of the Grand Island Lions Club in New York. The club collected more than 1,000 pairs of glasses with the help of young trick-or-treaters and a local Veterans of Foreign Wars post. Best of all, collecting eyeglasses for Sight Night is easy. Visit www.sightnight.org to download collection materials including fliers, door hangers and more. Prescription eyeglasses for children and adults -; and non-prescription sunglasses -; can be collected. In addition to door-to-door collection, contact schools, places of worship, local businesses, recreation centers, senior citizen centers and lost and found collections at malls, movie theaters and airports. More ideas about Sight Night are found here. Collect on your own this Sight Night, or expand your efforts by organizing a group. Sight Night is a fantastic project for involving schools, Scouts, Lions and Leo clubs, and other community organizations. This Grandma always likes an arts and crafts idea! Why not make door hangers for the charity the grandchild chooses and hang them in the neighborhood before Halloween to let the neighbors know that the grandchildren are choosing to give to others this year instead of seeking candy! Even young preschoolers can follow the directions to create a FREE doorhanger to color and for the adult to add the words for the charity the grandchild chooses! Click here. Older children can create their own from scratch. Or for Sight Night, you can use theirs. Grandma can still have her “signature” candy to give the grandchildren as a reward for the grandchildren’s effort at the end of Halloween Trick or Treat and this night the parents of the grandchildren will be happy at the amount! This Grandma starts young to teach the importance of giving to others. 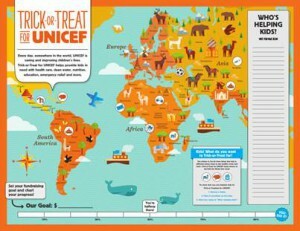 Give a donation to UNICEF for Halloween in honor of your infant or toddler grandchild who may be too young to participate this year. Show them the pictures of babies and children on the website. Babies love to see pictures of babies, and there are pictures of babies from around the world. They can be taught the message of charity later. Click here. When you give a donation to UNICEF in honor of your grandchild, the grandchild will receive a card acknowledging the gift which you can put in their annual photo album or scrapbook to talk about when they are old enough. Click here for the donation form. Take a picture of the grandchild trick or treating for charity to put in their annual album.